GeoSea said the Danish firm will continue to operate in Denmark in the offshore wind installation and service sector. Rumours that Siemens and Dong wanted to sell off their joint subsidiary had been circling for several years. Last week (30 June), A2Sea announced its CEO Jens Frederik Hansen had stepped down by "mutual agreement" after nine years at the company. He was replaced by CFO Michael Glavind with immediate effect. Dong and Siemens jointly owned A2Sea since 2009. "Owning an offshore wind turbine installation company, however, isn't within the scope of our core business, and we've therefore been looking for a new owner," said Dong Energy executive vice president and A2Sea chairman Thomas Dalsgaard. 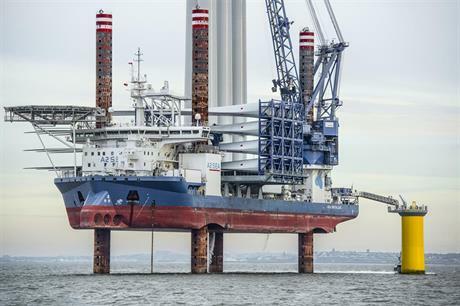 A2Sea has installed turbines at some of northern Europe's largest offshore wind projects, including work at Dong's 258MW Burbo Bank Extension project erecting 32 MHI Vestas V164 8MW turbines. GeoSea meanwhile recently won the foundation installation contract for EnBW's 112MW Albatros and 497MW Hohe See wind projects in the North Sea. "The activities of A2SEA represent a strong and complementary fit with GeoSea's operations. The combined organisations will be well positioned to provide a broader range of integrated services and solutions to offshore wind energy customers," said GeoSea managing director Luc Vandenbulcke. The transaction is due to be completed in Q3 2017, following relevant approvals.